Note 27th January 2019: Notice that ‘Space Station Inc.’ has been re-branded as ‘Space Station Designer’, which is under heavy development. We’ve decided to leave this blog post for historical reasons. Hello! Good to see you again! In case you missed it, last week we announced the project we have been working on for the last year: ‘Space Station Inc.’. As promised, in this post we are revealing more details about the game and the development process, so if you’re interested in the game and/or looking behind the curtain and find out more about the work we’re doing, read on! 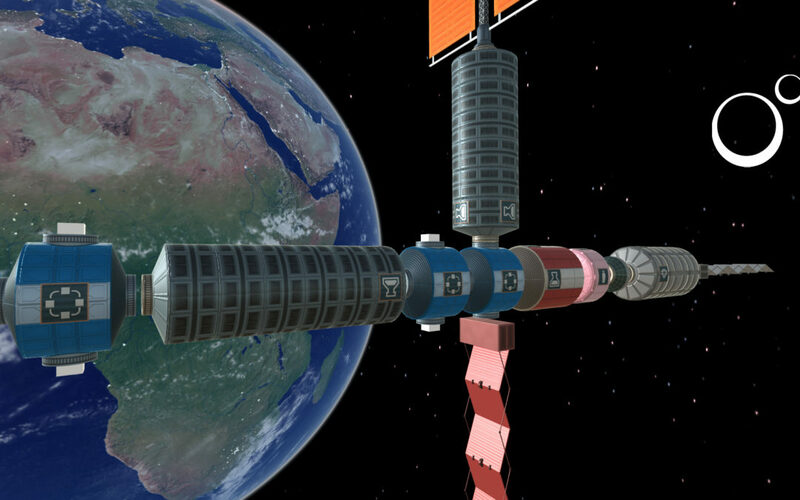 As we mentioned in our previous post, ‘Space Station Inc.’ or ‘SSI’ is a management game where the player is in charge of leading a private company that maintains an outpost in Earth orbit. The game starts with a minimal space station comprised of a single core module orbiting around the Earth. From that starting point, the player can then expand the station using a vast array of elements which include solar panels, commercial production modules, research laboratories and much more. 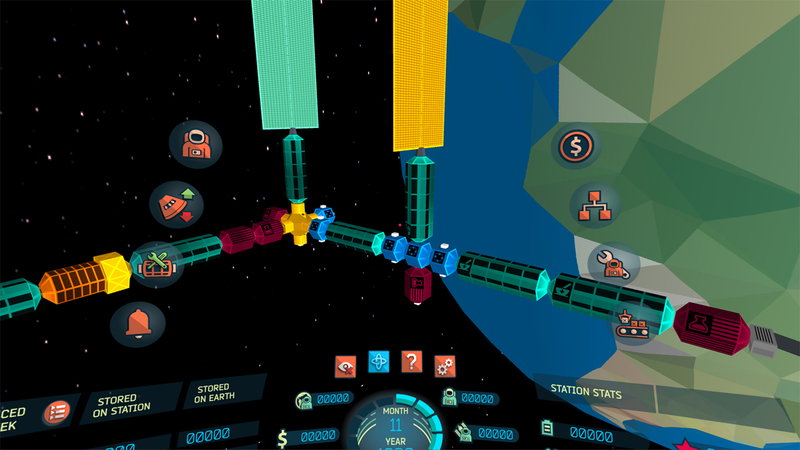 There are multiple victory conditions and throughout the game the player will have to make lots of interesting decisions such as planning how to staff the station, which type of modules to add and how to schedule the activities of the various crew members in order to keep the station healthy and productive. There’s also space tourism management activities and the possibility to augment the station’s capabilities by building facilities on Earth. 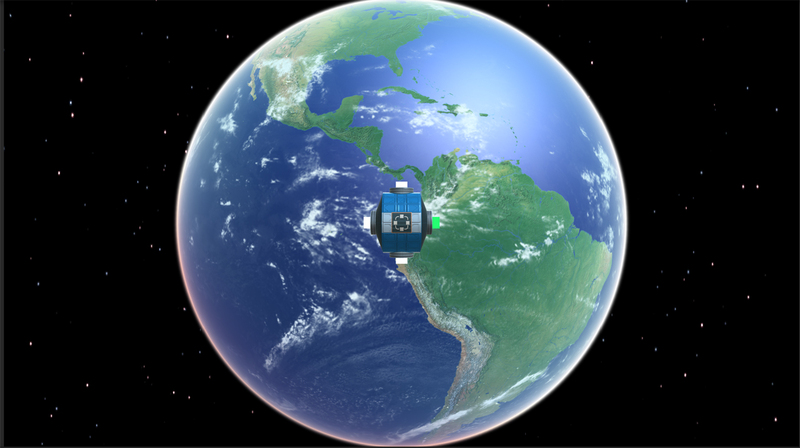 In-game screenshot of the Core Module orbiting around the Earth. The idea of developing a management game based solely on space stations was conceived sometime in mid-2015. Originally, our Lead Artist Mauricio and myself began working on a set of ideas for a space station game with the working title of ‘Space Station Manager’ or ‘SSM’. The plan was for us to work on a new project with a space theme, but with a more limited scope than a full-blown sequel for our game ‘Buzz Aldrin’s Space Program Manager’ which, as we had learnt, ended up becoming a massive project for such a small team. The plan for this new game was to have an interesting side project to work on and, more importantly, to be able to release it in a sensible timeframe. A few months later Sebastian, an active member of the ‘Buzz Aldrin’s Space Program Manager’ community who has recorded more than a hundred “Let’s Play” videos on this game alone (Season 1 and Season 2) and localized it to German in late 2014, contacted me via e-mail. After exchanging a few messages, he agreed to join us in order to give us a hand on various tasks such as game design, testing and balancing, and effectively became our ‘Development Manager’. Starting around August 2015 I began meeting with Sebastian at least once a week on Skype to discuss game mechanics and ideas for ‘Space Station Manager’, refining the concepts and ideas that Mauricio and I had started a couple of months earlier. In parallel, I was also working on the drafts for a series of articles chronicling the development process behind ‘Buzz Aldrin’s Space Program Manager’ (which would ultimately become our book ‘We Choose to Go to the Moon’) and doing some technical tests in order to start derisking the project. Mock-screen from ‘Space Station Manager’. Towards the end of 2015 I got some exposure to the latest generation of ‘virtual reality’ (VR) devices. Virtual reality is a technology that I first came into contact with in the mid-1990s when I was a kid, and that I was aware that it had been picking up some momentum during the last couple of years due to, in part, a successful Kickstarter campaign made by Oculus. Unfortunately, due to the hectic development schedule of ‘Buzz Aldrin’s Space Program Manager’, I had never found the time to learn more about this new set of ‘virtual reality’ devices. This all changed after joining Unity Technologies as an employee about a year ago, where I had access to the Samsung Gear VR, the Oculus DK 2 and the HTC Vive devices. Needless to say, after experiencing virtual reality myself and seeing the potential it has, I decided that I had to find a good excuse for our project to be able to support this platform. 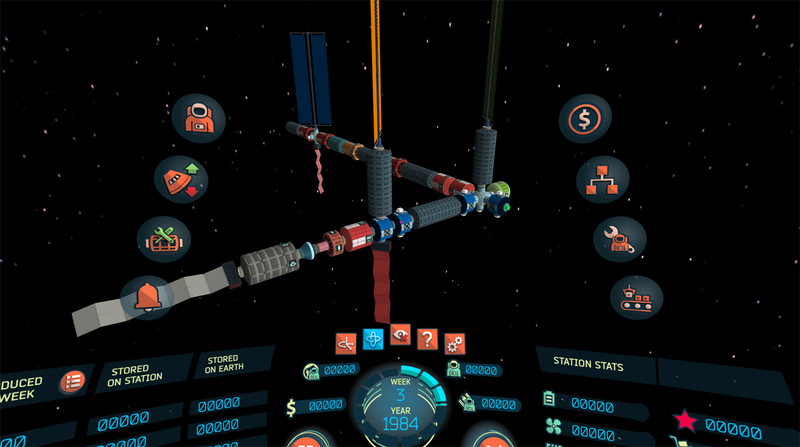 Thus, in late November 2015, we made a slight change of plans: we put ‘Space Station Manager’ on hold for a bit and started working on a reduced version, which was going to be available for desktop, mobile and virtual reality (VR) platforms. This reduced version would only focus on the construction aspect of the game, coupled with some simple trading mechanics. An SVN repository was created to this end and, according to the log, the initial commit was made on December 6th, 2015. The initial commit to our SVN repository. At the time of this writing, the SVN repository for our project comprises nearly 840 revisions, and the functionality we had planned for the reduced version of the game has already been implemented. However, to add more depth and increase replayability, we are expanding it by adding more game mechanics as well as bringing some of the features from the main game that we had put on hold in late December 2015. After some careful consideration, we have renamed our game to ‘Space Station Inc’. We have now reached a point where we are ready to publicly share our work with the outside world. The game is far from finished and, based on our experience developing ‘Buzz Aldrin’s Space Program Manager’, we know that the final release date for this new game is still quite far away. That being said, we have made some substantial progress and we’re now at a stage where we’ll be able to share our experiences and progress on a regular basis. A full narrative of the various events that transpired during the last ten months of development is definitely out of scope for this blog post (though they might as well materialize at some point in a book titled ‘We Choose to Remain in Orbit’ or something like that! ), so I’ll just skip that for now and provide a summary of where we are and where we are heading in the next sections. The first two platforms belong to a group we internally call ‘Flat’, in the sense that the interaction with the player happens via a ‘flat’ computer screen, whereas the last two platforms belong to the group we call ‘VR’. The ‘Desktop’ platform type is the one that encompasses personal computers running operating systems such as Windows and OSX. This is the platform type I use in order to quickly prototype the game mechanics discussed with Sebastian so that he can try them out and find out whether they are fun or whether they should be discarded altogether. 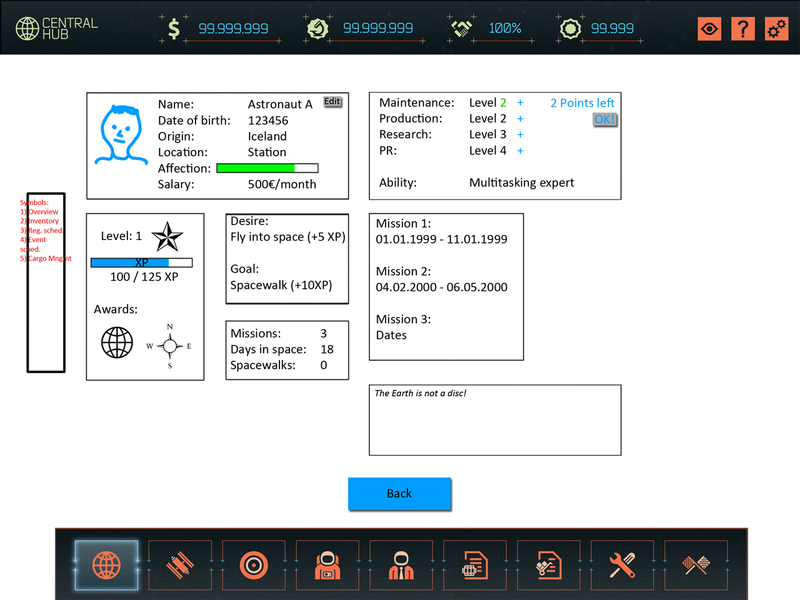 We have already implemented many of the game mechanics for this platform, such as ordering and installing space station modules, requesting resupply missions from Earth, hiring and training astronauts, creating production lines to group the various commercial modules to boost their combined outputs and a lot more. We’ll be covering the details of these game mechanics in future posts. For the moment I won’t be posting any screenshots of the ‘Desktop’ platform version because, quite frankly, the UI looks really crude! This is intentional, as our available time in order to work on the game is quite limited and we don’t want to waste effort polishing the UI for a feature that might end up being thrown away after a short session of playtesting. That being said, we can share some of the mock screens that Mauricio has been working on so that you can get a glimpse of what the final game might end up looking like when you play it on your PC/Mac. A mock-up screen depicting the User Interface of the ‘flat’ versions (i.e., “desktop” and “touch based”). The second platform is ‘Touch Based’. From a graphical point of view, this platform is very similar to ‘Desktop’, the difference being that the UI is being designed to allow players to interact with the game by using a multi-touch screen instead of a mouse and keyboard. Players will, for example, rotate around the station using a swipe gesture, and will fly towards to and/or away from it by using a pinch gesture. Another mock-up screen depicting the User Interface of the ‘flat’ versions. The third platform is ‘High-End Mobile VR’, which encompasses groups of devices such as the Gear VR and the upcoming Google Daydream. High-End Mobile VR allows users to experience virtual reality using a high-end smartphone coupled with a relatively inexpensive head-mounted display (HMD). We have been investing a lot of time resources on this platform and, at the time of this writing, we have a fully playable prototype that allows players to navigate their way around the station using the Gear VR’s touchpad, order new space station modules and deploy them. 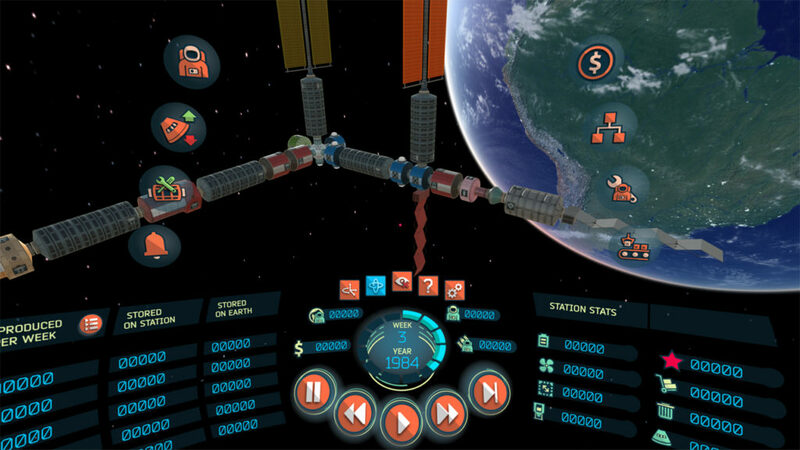 In-game screenshot of the ‘High-End Mobile VR’ version showing the space station. 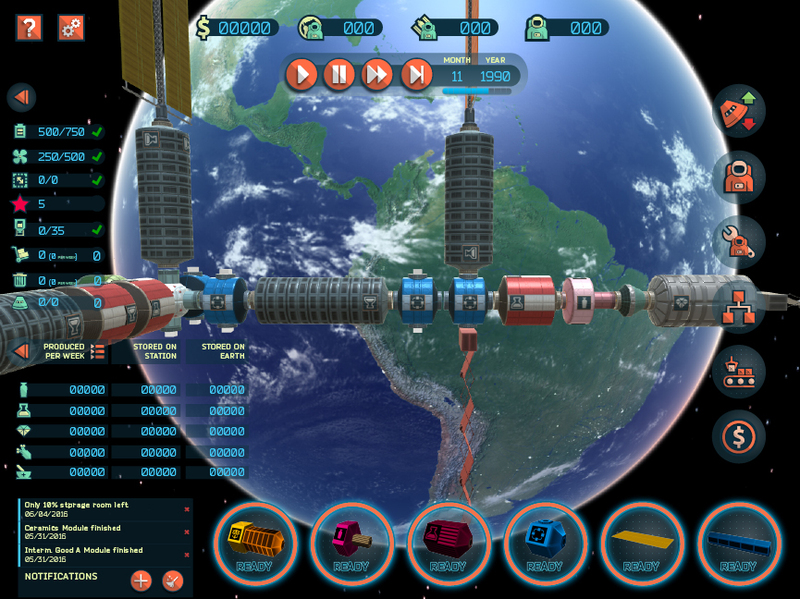 As you can see from the screenshots below, the UI looks and feels quite different than it does on the desktop platforms: in virtual reality, the player is sitting in a cockpit and interacts with various buttons and widgets which are rendered as part of the 3D world. Despite the fact that high-end mobile VR platforms support wireless controllers, the Gear VR doesn’t ship with one. Thus, we’re designing ‘Space Station Inc.’ so that players will be able to fully interact with the game by using the trackpad located on the right side of the HMD and by ‘looking’ at the various UI widgets, a mechanism known as ‘gaze-based interaction’. Players will also be able to control the game by rotating their head and pairing up with a wireless controller. This way, they won’t have to keep their right arm raised in order to use the trackpad. 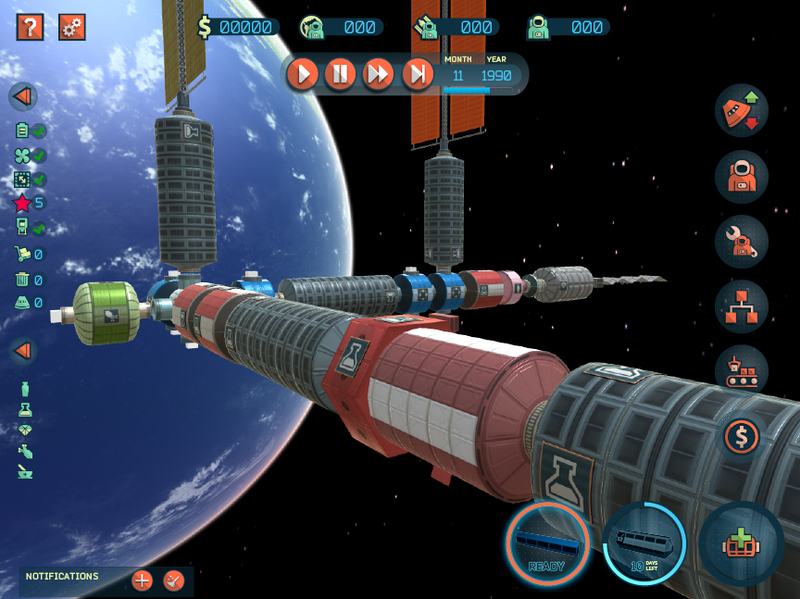 In-game screenshot of the ‘High-End Mobile VR’ version showing the space station from a different point of view. Notice that the 3D models used in the ‘Mobile VR’ version have a slightly lower level of detail than the desktop version. This is because these devices are not as powerful as desktop computers and they can only push so many polygons on screen per second. Looking “to the left” of the virtual cockpit in the ‘High-End Mobile VR’ version. As a side note, there’s also ‘Google Cardboard’, which provides a relatively low-cost virtual reality experience by using mobile devices coupled with inexpensive headsets. Originally, we were planning to support this set of devices too and even made a set of 3D models with an extremely low-number of polygons featuring an ‘stylised’ art style, which is quite popular among some of the VR games that have been released in the last couple of years. 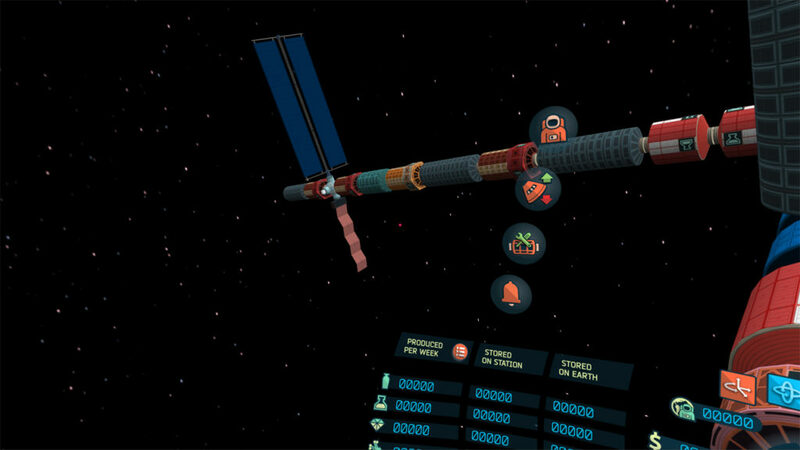 In-game screenshot of the Low-End Mobile VR’ version (no longer in development) showing the space station using an ‘stylised’ art style. Since the visual style is very different from the one used by the rest of the platforms and we are still unsure whether it’s worth allocating development resources for this, we are temporarily dropping support for ‘low-end mobile VR’ devices, but will leave this option open and re-evaluate it in the future. Looking “to the left” of the virtual cockpit in the ‘Low-End Mobile VR’ version (no longer supported). Last but not least, there’s the ‘High-End VR’ platform. This platform encompasses virtual reality devices that are plugged to a desktop computer or a game console such as the Oculus Rift, the HTC Vive and the soon to be released PlayStation VR. ‘High-End VR’ provides a similar experience to ‘Mobile VR’, with the difference that it uses the same high-quality 3D models used by the Desktop platform. 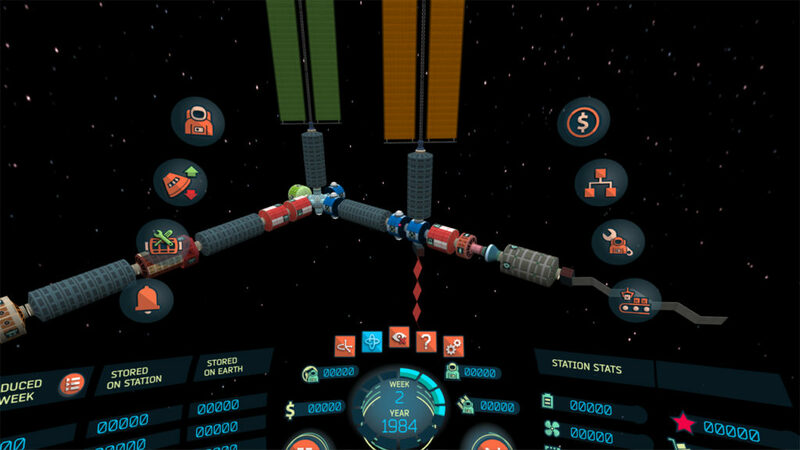 When playing ‘Space Station Inc.’ in ‘High-End VR’, players will interact with the game by wearing a head-mounted display and using their gaze and a joystick as input mechanisms. In-game screenshot of the ‘High-End VR’ version. UX design for both ‘Flat’ and ‘Virtual Reality’ modes. For the ‘game design’ aspect, our Development Manager Sebastian has been working on a ‘live’ online presentation in Google Docs where he details the game mechanics and provides mock screens and possible implementations for them. He and I then discuss the details and clarify any questions by using the Google Docs’ comment system and by holding weekly meetings via Skype. Once we are satisfied with a game mechanic, I go ahead and implement it in the ‘Desktop’ platform using a very rough UI so that it can be playtested and adjusted. This workflow has proven to be very effective, because by the time I sit down and start writing code, we are confident that any design flaws have been identified and resolved, preventing unnecessary and costly rework. For usability and user experience matters, I hold regular meetings on Skype with Mauricio on an ad-hoc basis. The minimum is once a week, but two, three and sometimes even four meetings on a given week are not uncommon either! There’s plenty of things to discuss and to agree on, given that each new gameplay feature needs to be designed separately for ‘Flat’ and ‘VR’ platforms. 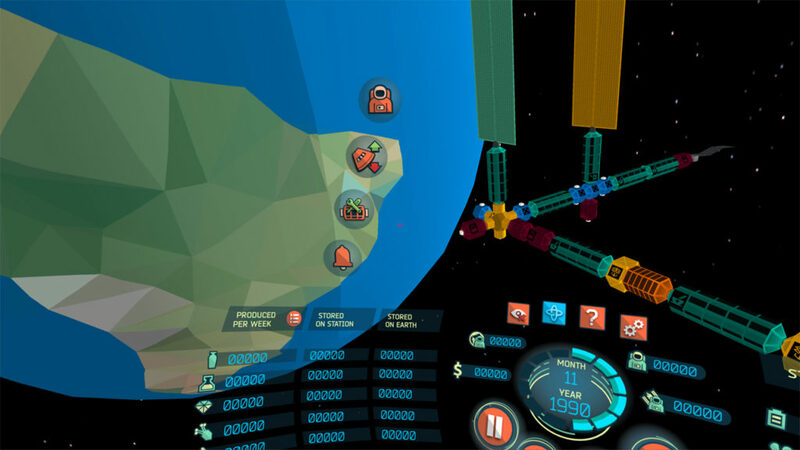 Personally, I’m finding that designing the user experience for VR and trying out different approaches to determine what works and what doesn’t has been one of the most rewarding tasks during the development of ‘Space Station Inc.’. We will be writing more about our experiences in this area in future blog entries. All of us at Polar Motion are very excited about this new game project, and we hope you share our enthusiasm too! Stay tuned to this blog, where we’ll be writing about our progress and findings on a regular basis. See you next time!